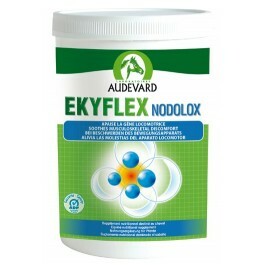 Ekyflex Nodolox is a complementary feed formulated by AUDEVARD Laboratories. It is designed to provide nutritional support for sport horses with increased musculoskeletal needs during competitions. All horses, regardless of their activity, experience strain affecting their musculoskeletal system and spine. Repeated strain may lead to discomfort or stiffness, and creates specific nutritional requirements. Sport horses are subject to strict doping restrictions, and certain ingredients are prohibited during competitions. Ekyflex Nodolox does not contain any ingredients with a doping effect.This formula relies on a combination of plants: white willow, boswellia and quercetin, and is rounded off with omega-3. Contains no ingredients that could lead to a positive result during anti-doping tests. Raw materials: White willow (Salix alba - titrated to 25% salicin), boswellia (Boswellia serrata - titrated to 65% boswellic acid), fish oil. Analytical constituents : Humidity < 10 %, crude protein 14.6 %, crude fats 7.6 %, crude ash 6.2 %, crude cellulose 9.1%, sodium 0.085%. Daily allowance: 1 to 2 measures per day for 30 days. Repeat as required. Contains salicin. During competition, do not give more than 6 scoops (30g each) per day. Product analysed for the Audevard anti-doping programme. Equistro Flexadin UCII is a complementary feed supplement that promotes healthy joints, and is ideal for horses that are subject to intense effort and regular exertion. Ekyflex Arthro is a complementary feed formulated by AUDEVARD Laboratories. It is designed to provide nutritional support for horses with increased joint needs, but it is also suitable for all horses. Ekyflex Nodolox Flash is a complementary feed formulated by AUDEVARD Laboratories. It is designed to provide nutritional support for sport horses with increased musculoskeletal needs during competitions.